SEDILO, Sardinia — The apartment where the architect Roberto Virdis and his family live is as modern as Sedilo, town of roughly 2,500 people, is historic. “This is a legacy from my father, but it is now our property,” Mr. Virdis, 44, said of the minimalist, white concrete-block building constructed in the 1980s. When Mr. Virdis began work on the apartment, one of two in the building, he and a friend knocked out several interior walls to create the 100-square-meter unit where the architect lives with Ms. Pau, 47, a textile designer, and their 5-year-old daughter, Agata. The work took about six months and cost around 45,000 euros, or $60,000, he said. The family moved in four years ago. A visitor now enters the apartment up a concrete stairwell and through a front door made of recycled wood. The main living room is an open space that includes dining and kitchen areas. Mr. Virdis also rebuilt part of the back wall to provide a view of the hilly terrain surrounding the house. “We created French doors where there was a much smaller window, so we could enjoy the landscape from our sofa,” he said. The couple’s bedroom offers the same view, and a balcony runs outside both rooms. Between the unit’s two bedrooms is the bathroom, with walls and floors of polished concrete that help keep the room cool even during the island’s hot summers. The floors in the rest of the apartment are larch wood. Mr. Virdis is also a furniture maker and interior designer, and his work can be seen throughout the house. (His pieces and those of other island artisans, are sold on www.dmogoro.com.) “This is a constantly evolving space,” Mr. Virdis said, sitting in a chair made of rope, one of his creations. He also devised a work island that sets off the kitchen and a wall that separates the living and dining areas and doubles as a cupboard. 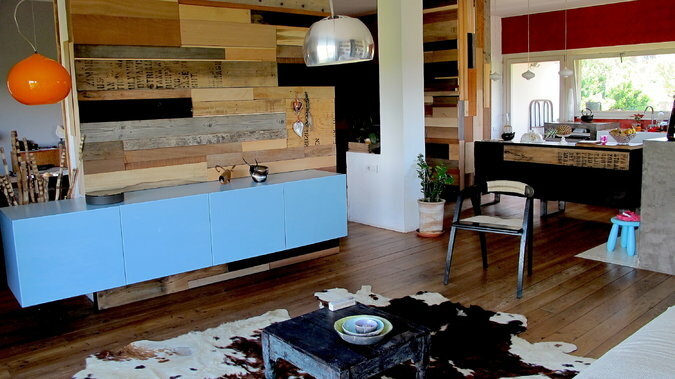 It was made from slats of recycled wood, something he used as often as possible in the apartment. “You can see in the house products that we are exporting from Sardinia,” Mr. Virdis said, referring to the textile throw draped across the sofa and a vibrant orange spread tucked onto a lower shelf of the bookcase. The market for architecture in Italy is very slow, he said, so he hopes to promote his other skills and get international orders from the website. Mr. Virdis has also worked on other homes in the commune, including the 80-square-meter, one-bedroom home of Simona Atzas and Costanzo Salaris. Mr. Salaris inherited the home from his grandfather, and the couple moved in after marrying in 2009. 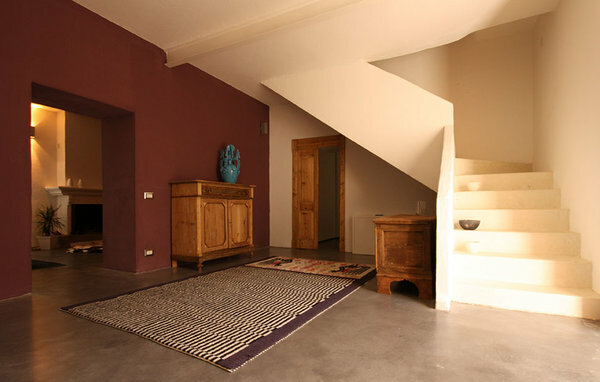 The narrow house, built in 1940 with thick stone walls now painted a cool white, was restored at a cost of about €80,000. “Work included a partial roof renovation, demolition, technical implants, the concrete floor and a new bathroom,” Mr. Virdis said, adding that it took around seven months to complete.The couple still have plans to renovate the first floor and add three bedrooms. During the renovation, Mr. Virdis knocked down several walls to make the living room, kitchen and dining room into an open space, with a fireplace at the center. Decoration includes Provençal furniture, armchairs from the 1950s and an Achille Castiglioni arc lamp.